In the magazine biz, the slush pile refers to those stories that haven't been commissioned, that writers, usually amateurs, have sent to the editors in the hope that they will get published. It's very rare that they do, because the stories are almost never good. When I was editing an outdoor magazine, we received many hiking articles. Hiking is a deceptively hard subject, because it's rare that anything interesting happens on a trip. Tim Cahill, whose Outside magazine columns were some of the best outdoor writing I've ever read, once said that when travel writers have nothing to say about a place, they get spiritual. That was the case with many of the slush pile entries I screened. One hapless fellow often submitted. He was an outdoor educator and traveled a lot. One day, I received an unsolicited article from him that seemed vaguely familiar. I went through the slush folder and found two other hiking articles that he had previously sent in. One of them began, "Look! A caribou!" The second: "Look there! A whale!" The most recent: "Look! A moose." He had begun each piece with the same bad lead, mistakenly thinking that this was the ideal entree into the story. But as the head editor pointed out, "Quote leads went out with hoop skirts." When I started writing magazine articles, occasionally I'd bog down in the middle of the piece and not know how to proceed. My notes didn't point the way out of these dead ends and I'd find myself blue skying it -- writing off the top of my head. This doesn't work with nonfiction, and the problem eventually became clear: I hadn't done enough research to support the article through its twists and turns. I haven't had that problem in years, because I know now to gather enough material. Sometimes, of course, you bog down and have to work your way out of it, but with enough research to draw on, there is always an exit. On June 2, I'm giving a talk on Risk and Adventure, and then taking part in a panel discussion about it at The North Face store in Banff, Alberta. Details here. 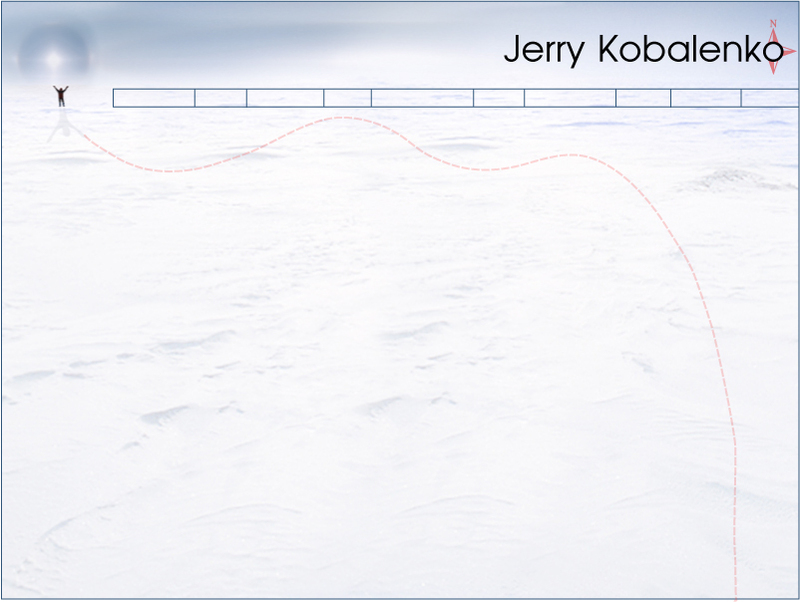 Check out this profile of Jerry in the online adventure magazine, Limitless Pursuits. 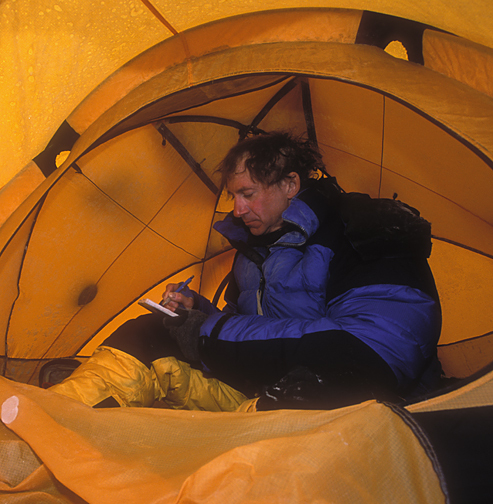 On every expedition, I spend about an hour a day making notes, usually in the lull between soup and supper, when I'm melting water for the Thermos. 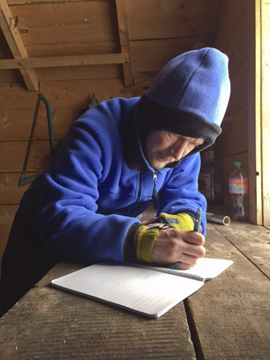 The stove warms up the tent enough that I can usually write with bare hands or liner gloves. In the cold, where ink freezes, I use a mechanical pencil, insulated with moleskin. I start with the basics: how many hours we went, how far we made, weather, travel conditions, any wildlife sightings. What was the terrain like? Did it change from the day before? How do my partner and I feel? Any good jokes between us? Any phrases or metaphors that popped into my head during the day that describe some aspect of the journey well? Those are particularly useful; I include them in my blueprint when I'm mapping out some future story or chapter. For example, the Quadruped Principle: four-legged animals haul more strongly than two-legged ones, and one of the technical aspects of manhauling (which few beginners grasp) is that ski poles function not for balance or as feelers but as third and fourth legs. The longer the journey, the more you use your arms. (At first, they're just not strong enough.) By the end of an expedition, your triceps should be as well-developed as your thighs. 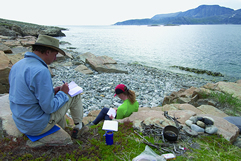 On this latest expedition, my partner James MacKinnon is also a writer. (Here's a link to a recent piece of his in The New Yorker.) We had the usual writerly conversations about how hard it is to make a living, and had a good laugh about the cattiness of writers gatherings. About his bestselling The 100-Mile Diet, one author asked him, "So, did you set out to write a middlebrow book?" James also diligently recorded his impressions, and every evening, the conversation died for an hour as we scribbled. 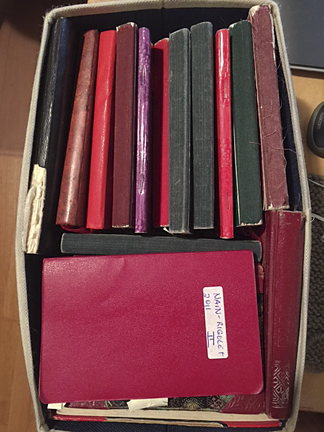 For me, my notebooks form the basis of articles and books. They refresh my memory, add detail and enrich the language. In a disaster, if I could only save one thing from our house, it would be them.